When a captain pulls his ship into the harbor, he knows he can breathe easier. The harbor is where rest and restoration happen. At Harbor Church, we invite you to come, join your heart in worship, and find a place where you can breathe a little easier. Harbor Church is here to help you restore your soul, find healing and wholeness, and rest in the presence of Christ. 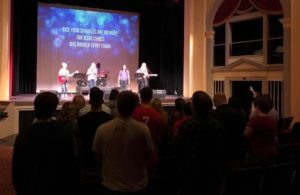 Services are held every Sunday at 10:30 am at the Turnage Theater in Downtown Washington.